In April 2017, United Airlines personnel and security officers at Chicago O’Hare International Airport violently removed Dr. David Dao from flight 3411. The reason? The flight was oversold, and United wanted the seats for its own employees. The backlash came almost immediately. People raced to condemn the airline. One of the security officers was placed on leave. United’s CEO was under fire, and forced to release a contrite apology calling the event “truly horrific.” New rules and regulations regarding oversold flights were put into place. This incident is an isolated and extreme example, yet it seems to confirm what many people think about air travel today — that the airlines would rather make a quick buck than care about customers. While it’s fair to argue whether airlines are committed to customer service today, it’s very clear to observers that customer service should matter to organizations in all industries. An organization simply does not exist without customers, and customer service represents the active role organizations play in connecting with those customers. Good customer service might be a differentiator for companies that provide similar or commodity products, and superior customer services might justify premium pricing in some industries. Has the decline in customer service had an effect on the number of people flying? 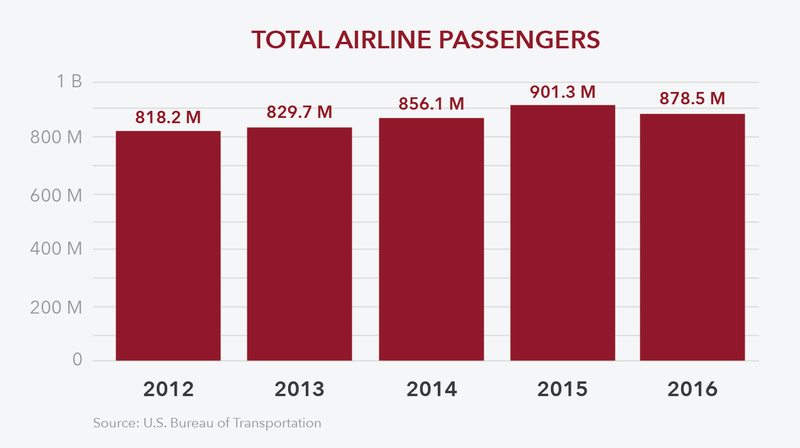 It’s hard to determine a causal relationship, but passenger numbers have generally been on the rise since 2012, with a dip between 2015 (a record year) and 2016. However, there is also conflicting evidence that actually shows conditions are getting better. The American Customer Service Index reported that customer satisfaction for airlines has risen 4.2 percent in its 2017 Travel Report. Airline call center satisfaction was up three percentage points, and flight crew courteousness was up two percentage points. 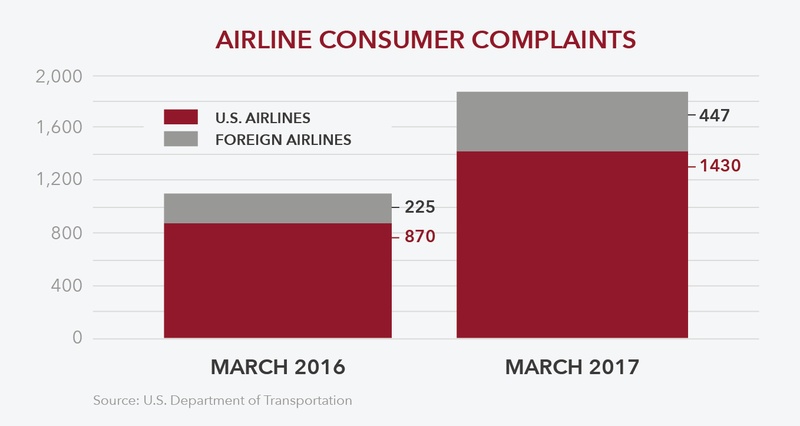 The lesson from these conflicting stats is that it’s too complicated at this point to draw a direct connection between customer complaints, passenger travel and overall satisfaction. The media maelstrom of United Airlines from the above incident did not have a major impact on stock; in fact, despite an initial drop, the stock quickly recovered. While legroom becomes shorter and the cost of additional services like checked baggage increases, there’s one segment of airline customers that are experiencing an increased level of customer service: first- and business-class passengers. Airlines are rushing to replace first-class cabins, renovate airport lounges, and rethink the entire experience for high-paying customers. United recently unveiled its Polaris Business Class, introducing new lie-flat beds, Saks Fifth Avenue bedding and multicourse dining. Polaris airport lounges feature private showers and daybeds. Clear communication: Air travel can be a confusing experience, and a customer service representative must be able to convey information in a way that’s timely and useful. The airlines have been making some progress in this through technology: Airline apps can inform people when gates have been changed or boarding times have been delayed. Empathy: Customer service people need to be able to relate to any passenger, even one that is having a terrible day because of a delayed flight or missed connection. Patience: A customer service representative should never turn his or her attention to the next customer until the current one has been completely satisfied. Social media savvy: In the past, when customers had a complaint, they’d speak to a gate agent or call the airline. Today, they’re more likely to post about their problem on social media, including Twitter and Facebook — which means the world is watching to see how the airlines react. Because of this, airlines need to have highly responsible social media teams that can offer quick, helpful, understanding responses. Failure to provide assistance, or even to respond in a timely matter, can hurt an airline’s reputation.